Pasta chî sardi is a wonderful typical Sicilian dish that is both incredibly easy to make and very cheap. If you are the sort of person that doesn’t see the magical genius of foods that come in tins- look away now. However, if- like me- you love a belly full of bargain food that tastes about a millions times more expensive than its costs, then please COOK THIS NOW. Pasta con le sardi is such a big deal in Sicily that its recipe and integrity is protected by law by the Italian Ministry for Food (seriously). According to them, it is a seasonal dish and should be made between March and September. Since it’s now February, therefore 27 days short of their guidelines I hope the Food Police don’t come for me. 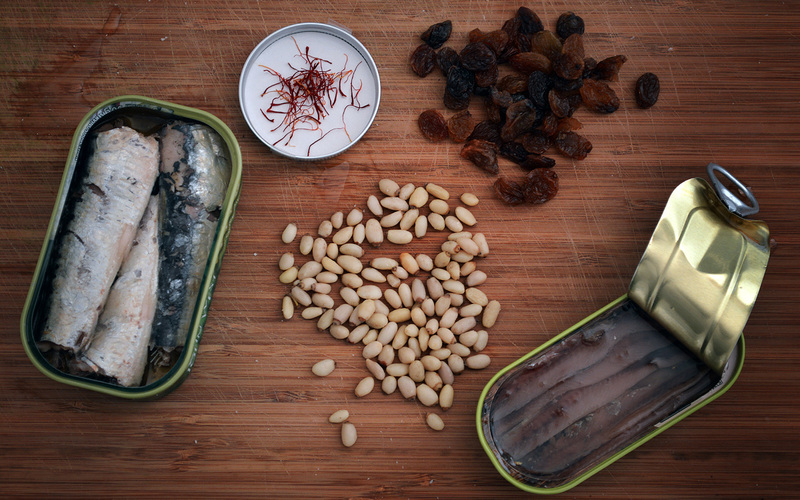 The dish is seasonal because the original, true recipe calls for fresh sardines. However, loads of people, including respected chefs in italy and abroad, all argue that the tinned variety can be acceptable too. Fry the breadcrumbs in a little of the sardine oil until golden. Reserve on a plate then wipe the pan and toast the pine nuts. In a large frying pan, gently sweat the onions and the leeks with a pinch of salt until soft and slightly golden. Meanwhile, cook the pasta. Make sure you cook it for a minute less than the packet instructions and reserve the pasta water. 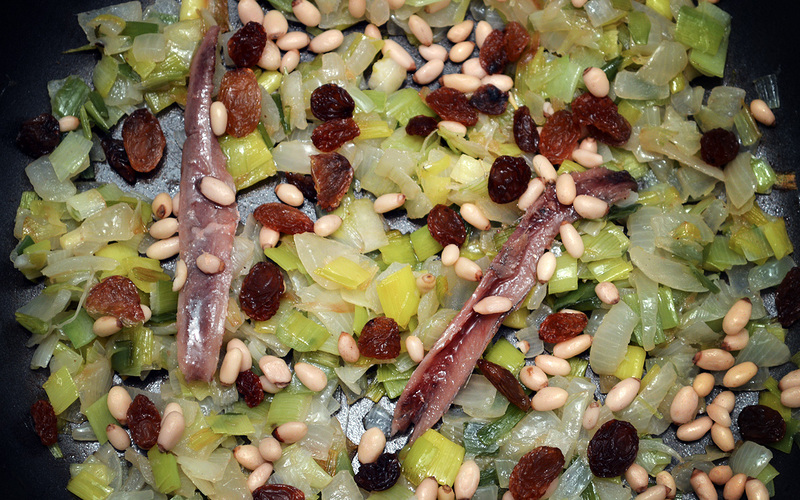 Add the saffron, garlic, anchovies, raisins, chilli flakes and pine nuts to the onions and leeks. Let them all get nice and cozy in that frying pan for a further few minutes. Add the wine and cook for two minutes or until the alcohol has disappeared, then add the sardines and break them up roughly with your wooden spoon (i like to keep some big chunks in there). Toss the almost-cooked pasta in the pan. Let it cook for further minute with the sauce- make sure you add little spoonfuls of the pasta water to keep everything moist. 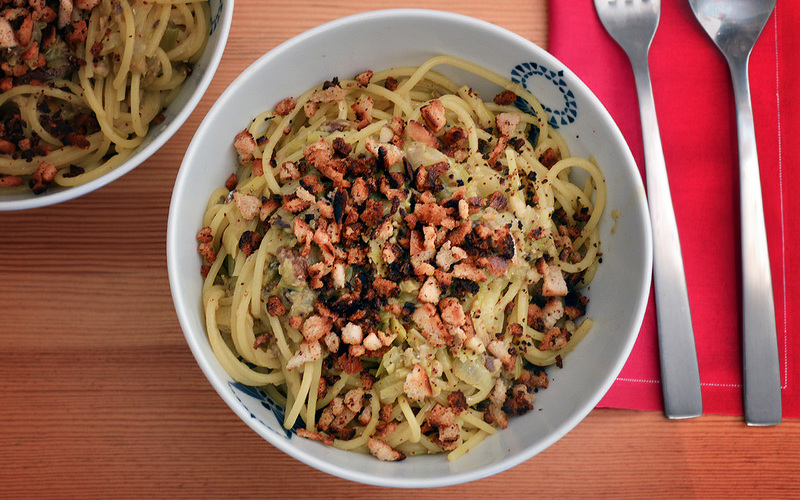 Season to taste with a drizzle of olive oil, scattering toasted breadcrumbs on top. Experimenta Sim, muito bom e facil! beijos! Looks yummy, I love sardines!